When I see the stock market roar over workers getting squeezed and screwed I'd like to scream. But such is today. 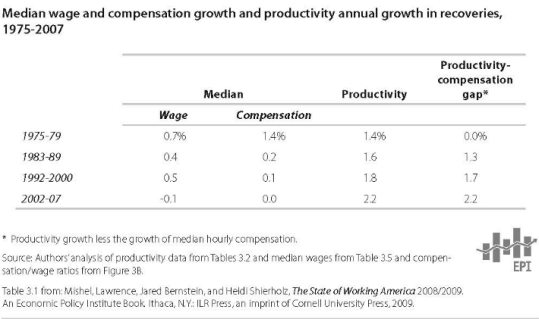 The Q3 2009 Productivity and costs report is out. 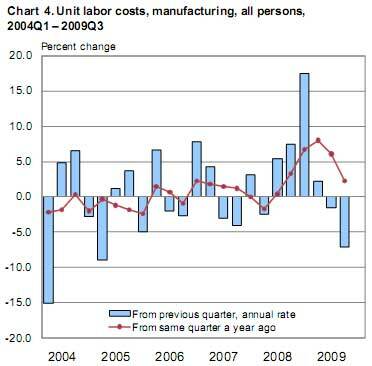 Productivity increased to 9.5% annual, Labor costs dropped 5.2% in just Q3 alone, -3.6% annual. Nonfarm business sector labor productivity increased at a 9.5 percent annual rate during the third quarter of 2009, the U.S. Bureau of Labor Statistics reported today. This was the largest gain in productivity since the third quarter of 2003, when it rose 9.7 percent. workers. 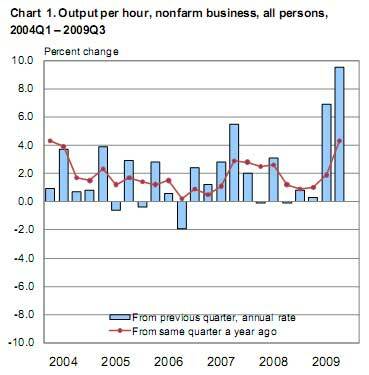 Output increased 4.0 percent and hours worked decreased 5.0 percent in the third quarter of 2009 (all quarterly percent changes in this release are seasonally adjusted annual rates). Look at this, wages, are at the lowest since 1948. Unit labor costs in nonfarm businesses fell 5.2 percent in the third quarter of 2009; the increase in productivity outpaced the increase in hourly compensation. Unit labor costs declined 3.6 percent over the last four quarters— the largest decrease since the series began in 1948. Why this is bad news for workers and the middle class squeeze? BLS defines unit labor costs as the ratio of hourly compensation to labor productivity; increases in hourly compensation tend to increase unit labor costs and increases in output per hour tend to reduce them. Why the stock market roars when workers are getting squeezed is beyond me. For an economy that is 70% consumer driven, where exactly do they believe consumers are supposed to get the money to go out and buy stuff? What this report really means is workers are being paid way less and worked to death even more. This also is bad news for future job growth. As long as employers can squeeze out even more work for less from U.S. labor, that's one less new person they need to hire. Seriously Wall Street, it's like watching a vampire feed and on top of it, the entire U.S. middle class turned into the walking dead. Do you think comatose, tapped out Zombies are going shopping anytime soon? The report also gave just manufacturing productivity and labor costs. 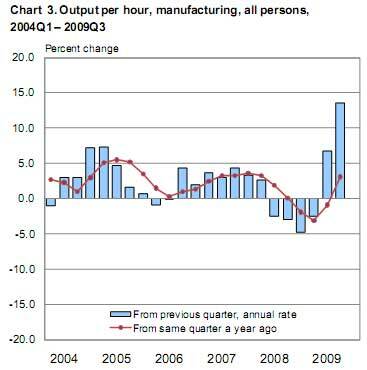 Manufacturing sector productivity grew 13.6 percent in the third quarter of 2009, as output increased 7.7 percent despite a 5.2 percent decrease in hours worked. This was the largest increase in the quarterly productivity series, which begins in 1987. Over the last four quarters, manufacturing productivity increased 3.1 percent as output and hours declined 10.8 percent and 13.5 percent respectively. Manufacturing sector productivity increased 0.8 percent in 2008, and at an average annual rate of 4.0 percent from 2001 to 2007. 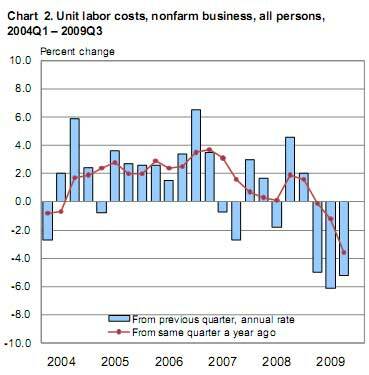 Manufacturing unit labor costs fell at a 7.1 percent annual rate in the third quarter of 2009, but increased 2.3 percent over the last four quarters. Brad Delong, gets a little bit of scream in him as well. Baseline Scenario explains a little more, abet I think he also believes that somehow the 1950's, where workers had to be physically located all in one nation, is the same as 2009, where jobs can be offshore outsourced due to global shipping and that magic thing called the Internets. Just because this variable didn't exist in grad school, oh yet great Economists, doesn't mean it's is not coming into play now! Double negative and I feel damn negative damn it!